At the time of automatism, there is great interest in using automatic milking systems (AMS) in dairy herds with objectives of reduced workload, higher milk production, and respect of cow welfare, it is a reality! For example, Canada counts 1000 farms equipped with AMS and 400 farms are using it in Japan today. 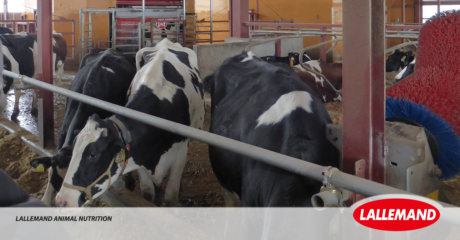 It already represents 7% of farms in Tokachi, Hokkaido, a major dairy area in Japan, with a commitment from most innovative feed companies to grow this practice. At a time when smart farming and big data revolutionize animal management, milking robots supply cow-related information unobtainable in a conventional situation that can help farm management and optimization. This is why Lallemand-Biotech organized for its dairy partners a one-week dairy educational seminar tour in Japan from 5th to 9th February with the contribution of international experts Mr. William Woodley, Canadian dairy consultant and Mr. Laurent Dussert ruminant category manager Lallemand Animal Nutrition. This was also the opportunity to promote synergic solutions for cow health natural antioxidant combo and cow digestive comfort probiotics. This tour was made possible thanks to Lallemand partnership network with several dairy groups. Such initiative greatly contributes to affirm the position of Lallemand Animal Nutrition as a dairy expert in Japan towards leading farmers, major feed miller, and several Agricultural cooperatives.